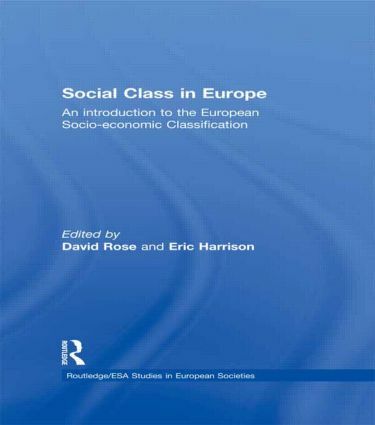 This timely volume introduces a new social class schema, the European Socio-economic Classification (ESeC), which has been specifically developed and tested for use in EU comparative research. Social Class in Europe aims to introduce researchers to the new classification and its research potential. Since socio-economic classifications are so widely used in official and academic research, this collection is essential reading for all users of both government and academic social classifications. While primarily aimed at researchers who will be using the ESeC, the book’s contents will also have a wider appeal as it is suitable for students taking substantive courses in European studies or as a supplementary text for undergraduates studying the EU, Sociology and Economics. Because of its inherent methodological interest, the book should prove a valuable tool for undergraduate and graduate courses that discuss how social scientists construct and validate basic measures. It will also be required reading for policy makers and analysts concerned with social inequality and social exclusion across Europe. Stable and consistent with the employment relations theoretical background? Does the prototype ESeC show these qualities with French data?